Inkjet printers, are rather common in households and small scale offices. These printers are cheap because the technology used in them is cheap — ink spraying. 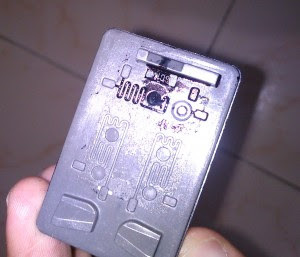 There are cartridges filled with ink and an electrical circuit to control which pores are opened and which are not. And it generates the characters and images on the paper. Why you should refill ink in the cartridges yourself? Because, it’s cheaper, and you do it properly. A lot of shops can be found offering cartridge refilling services, but they charge like $1 or more for refilling a cartridge and don’t do it properly. I’ve often had to buy new cartridges due them filling poor quality ink and choking or spoiling the electrical circuits. The refill kit is available for around $10 and half a litre of black ink costs around the same, $10. So if you calculate, you can refill the cartridge 50 times (assuming each refill takes 10mL) and the cost per refill comes out to be $0.4, including the equipment cost as well. If you don’t include that, then it’s $0.2. Very cheap! Refilling cartridges may void warranty of your printer, so you better check with manufacturer’s terms before attempting this. For the environment enthusiasts, I would like to point out that refilling cartridges is environment friendly — because every time you buy a new cartridge, the product has gone through various industrial processes, new plastic is used, etc. Also, when you dump your old cartridge in garbage, it simply goes into dumping grounds and as you might be knowing, plastic takes ages to decay, so why not recycle it? As of writing this, I myself have refilled my printer’s black cartridge about 5 times, which means I saved $15 * 5 – $20 = $55. Some printers have detachable print heads and others have non-detachable print heads. In printers with detachable print heads, the electrical circuits to control pores along with the ink supply are enclosed in one single detachable part (that’s why detachable head). In printers with non-detachable heads, the electrical circuits to control pores are fixed with the printer, while the ink supply is a different unit and can be replaced. If you have a printer with a non-detachable print head, make it sure that you buy a good quality ink, otherwise the pores could get blocked and would cost you a lot to get it repaired. You should be concerned about the ink quality even with detachable print heads, because the print heads cost around $12 or above, depending on the quantity of ink, the make, and other factors. You don’t want to spend on new cartridges because the pores got choked due to bad quality ink, do you? But in general, if you have a printer with a detachable print head, you’re on a safer side, in the sense that you can buy a new original cartridge if for some reason the one you’re using gets choked. Enough of discussion about print heads and stuff, now let’s come to the point — how do you refill the cartridges? In this article I’ll be covering the refill process only for detachable heads due to certain limitations, which should give you an idea about refilling non-detachable heads as well. 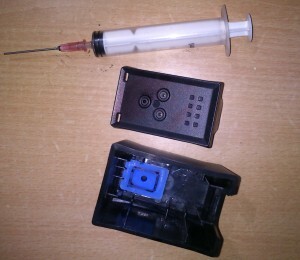 It’s quite simple, there are holes provided to inject ink into the cartridge. The photo below is of a HP 21 cartridge (black). The top sticker has been removed and you can clearly see the hole. Color cartridges have three holes instead of one, because they contain inks of three different colors – Cyan, Magenta and Yellow. If you want to refill color cartridges, you have to buy inks of all three colors separately. 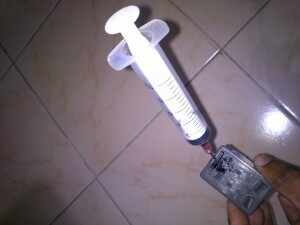 To refill the cartridge, you simply need a syringe, a needle and a bottle of ink. Yes, that’s it! But, as I stated earlier, refill kits are available, which do a much better job. They come with a syringe and a blunt needle, so that you don’t inject ink into yourself! Also, a case (box) to carry out the process so that spilling does not occur. Below is a photo of the ink refill kit I bought from eBay. The process is very simple. You fill the syringe with ink and then inject it very slowly into the cartridge. If you bought a refill kit, then follow the kit’s instructions. Its very simple to refill a cartridge. I refill my black ink cartridge myself, but I have never tried to refill a colored cartridge. It is very simple to refill it also. Its true that refilling your cartridge own will help you to save the cost. Some people do not like refilling, they can click on the below link to buy a new cartridge. Although refilling a ink cartridge is a good idea but i prefer buying ink cartridges. Its true that buying them costs more than refilling, but refilling requires a professional help & a slight mistake can damage the cartridge.